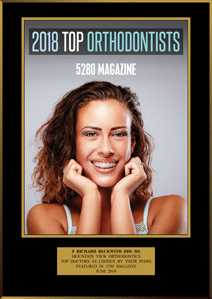 Our office has been voted the #1 orthodontic office in Longmont by our peers in the dental community as published by Denver’s 5280 Magazine every year since 2008. In 2013-2018, we have shared the top honors. The top orthodontist results are published each year in the June issue. Dr. Beckwith has taken the extra steps to achieve his American Board of Orthodontics certification. Historically, only 20% of orthodontists have completed ALL aspects of their board certification. To achieve this certification means that Dr. Beckwith passed a comprehensive written examination covering all aspects of orthodontics. Many orthodontists stop here as Board Eligible. Dr. Beckwith continued on and completed an in-person oral examination with Board examiners to assess his treatment planning abilities, orthodontic thought processes, and knowledge of past and present research in orthodontics. Lastly, the most challenging aspect of Board Certification, Dr. Beckwith also presented patients to the Board that we have treated in our office. Many orthodontic Board candidates initially fail and have to redo part or all of the exam. Dr. Beckwith aced all aspects in his first attempt. These patient records are on display in our on deck patient area. Experience. Dr. Beckwith knows he is a better orthodontist now than when he began in private practice in 1996. There is no substitute for the knowledge that has been gained from treating what is now thousands of orthodontic patients. We have a highly skilled, experienced orthodontic team that takes great pride in continuing to learn and implement the latest proven technologies in orthodontic care. State-of-the-art technology including digital radiography (x-rays), soft tissue laser, computerized scheduling, and automated appointment reminders. Near invisible treatment options in the form of “clear” braces and removable aligners such as Invisalign®. An energetic and fun environment in which to receive the very best orthodontic care available from a caring and compassionate and cohesive orthodontic team!